Last month, federal judge William Kuntz of Brooklyn, New York, ruled that families who refuse to vaccinate their children do not have the constitutional right to force their kids on the school population. Religious reasons are no excuse – even when religious exemptions from vaccination have been granted to the students in question. The anti-vaccination families have indicated that they will appeal the judge's ruling. For more information on this story, click here. ~ Federal court rules against anti-vaxxers. Besides citing religious reasons, anti-vaxxers also claim that vaccination has many side effects and may cause autism. All nonsense; even the Autism Science Foundation disagrees. 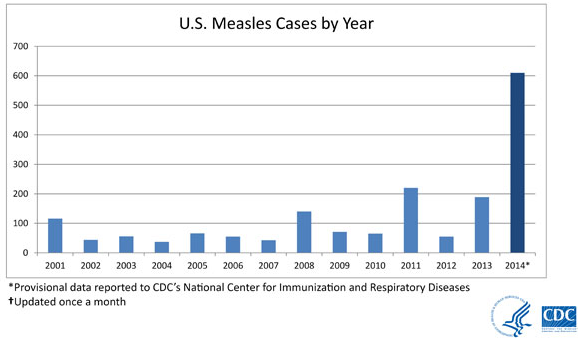 Also, read a recent article: "Another Blow to Anti-Vaxxers’ Fortress of Pseudoscience." However, this silly movement is getting support from the political Right (people who want less government) as well as the political Left (people who don't trust "Big Pharma," click here). This is an issue that should not be politicized. This is a matter of medicine and science. ~ Fox News commentator supports the anti-vaxxers. In fact, because of people's refusal to get vaccinated, the mumps, measles, rubella, flu, polio, whooping cough, and other preventable diseases are on the rise in the United States and around the world, click here. The people who don't want to vaccinate themselves and their children argue that if other children are vaccinated, what harm is there if their children are not vaccinated? First, you have a responsibility to protect your children regardless of your religious beliefs. As in a recent court ruling has shown, people who knowingly let harm come to their children for whatever reason will be prosecuted and punished; read our story from last year, "Fanatics Denied Medicine To Kids; 2 Died." Furthermore, unvaccinated locals who travel and foreign tourists may bring diseases into your community to infect others who have not been vaccinated. They include babies (under 12 months), pregnant women (for certain live vaccines), and people with immunity issues as well as those – especially children – undergoing treatment such as chemotherapy (see video immediately below). Updated video (Jan. 29, 2015): We must protect the weak. Vaccination does not work for 100% of the people. For diseases like measles and whooping cough, some children who have been vaccinated still contract the disease for some reason; one dose of the measles-mumps-rubella (MMR) vaccine is about 93% effective in preventing measles. And for other people who have been vaccinated successfully, the protective effects of the vaccine may wear off over time, click here. So, it is vitally important that EVERYONE in society get vaccinated regularly, click here. The need to vaccinate all of society is explained by a theory called "herd immunity." In herd immunity, the more people there are in society who have been vaccinated, the less chance the unvaccinated people will become sick. So, those people who fall through the cracks in society, like homeless people, the mentally challenged, and people living below the poverty line, should be protected by others – like capable adults and school children – who have the knowledge and ready access to immunization. The math is simple; the longer the disease is kept alive in our bodies, the more virulent it can become and the harder it will be for society to fight it. The more people there are who have been vaccinated, the less time the disease will have to cultivate itself and spread. ~ The backlash against science has great consequences. There are two issues that the religious Right, and to some extent the Tea Party, don't understand; and we also mustn't forget the hardheaded position of some people on the Left, such as the New Agers and alternative-medicine types (like homeopaths). First, scientific facts cannot be bent to fit a political agenda or a personal belief. How are the vaccine truthers any different than the Young Earth Creationists or Climate Change deniers? Their reasoning is based on pseudoscience at best and on utter rubbish at worst. Updated video (Feb. 4, 2015): Glenn Beck doubles down. Second, anti-vaxxers and religious fanatics seem to think that their liberty can override the welfare and rights of others. By citing religious reasons or personal belief as an excuse, they claim that they have the right to not pull their weight in society by not vaccinating themselves (click here), by denying others healthcare (click here), and by discriminating against certain groups, such as gays and lesbians (click here). In society, communicable diseases are a common threat that require concerted action by everyone. Your rights end where our noses (and lungs) begin. ~ As ignorant as before; they used to blame the plague on witches.